Since we started feeding the birds in this garden, Ryan and I have been peacefully co-existing with a squirrel, who managed to find a (very entertaining) way to help himself to the bird seed. He is bold as brass, and we enjoy watching his antics. He’s easily recognisable, due to a tatty tail. 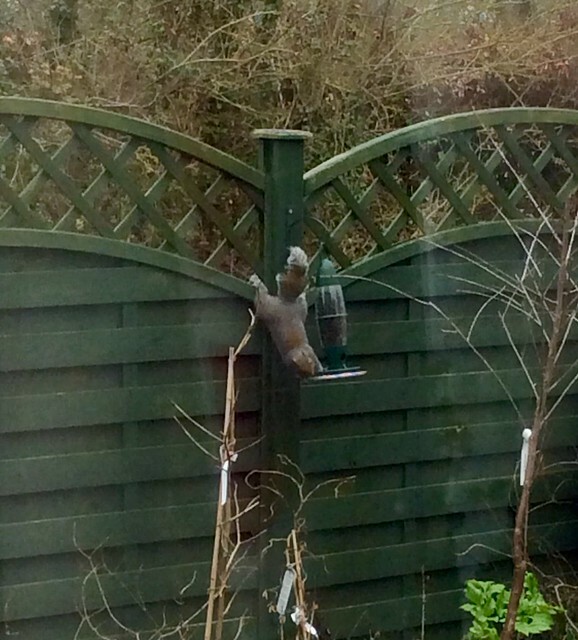 Towards the end of last year a pair of new squirrels found their way to our bird feeders, and they were less welcome. They insisted on chewing their way into the plastic feeders, which were increasingly damaged. This was extremely annoying, because we went through several designs of bird feeder until we found one the birds would actually use! Most of the time we don’t see the squirrels on the feeder – I think they get up earlier than we do. But when we do seem them they sit there for a long time, eating sunflower seeds to their heart’s content. The second prong of our attack was to invest in some metal-mesh bird feeders, which are supposed to be squirrel proof because they have a mechanism which shuts off access to the food when something heavy sits on the feeder. It doesn’t entirely work, but since the squirrels can’t chew through the metal mesh and damage the feeder, we can live with that. We’re lucky that our local environment is home to quite a lot of wildlife – many bird species, squirrels and rabbits (fortunately the main garden is well fenced!) and itinerant ducks. We saw a deer on one of the recent snowy days; normally we just catch a glimpse, but this one walked right in front of me. Wildlife charity People’s Trust for Endangered Species (PTES) is calling for volunteers to take part in its annual Living with Mammals survey, by asking members of the public to survey a garden or local green space once a week between Monday 26th March and Sunday 24th June 2018 and recording the wild mammals they see. Volunteers can choose any green space to survey: this could be a rural or urban garden, an allotment, a park, or a green space near to work, as long as the site is within 200 metres of a building. Once a suitable space has been identified, PTES is asking volunteers to visit this site for a short amount of time each week, and record any sightings of mammals, or the signs they leave behind, such as droppings or footprints. Volunteers can submit their findings online at www.ptes.org/lwm, which is also home to a guide on how to spot mammals, and how to tell a pine marten from a polecat, if you’re lucky enough to see one!